BACLAYON, BOHOL – I had looked into the possibility of doing some hiking here in Bohol tomorrow but my priorities here are to spend time with my relatives and to read a textbook that I need to finish! Anyway, I slept soundly last night after our nice Mt. Daguldol dayhike, and after waking up this morning I proceeded to go to Bohol via Cebu Pacific Flight 617. I’ve always enjoyed looking out from a plane window to see the world from a different vantage point. 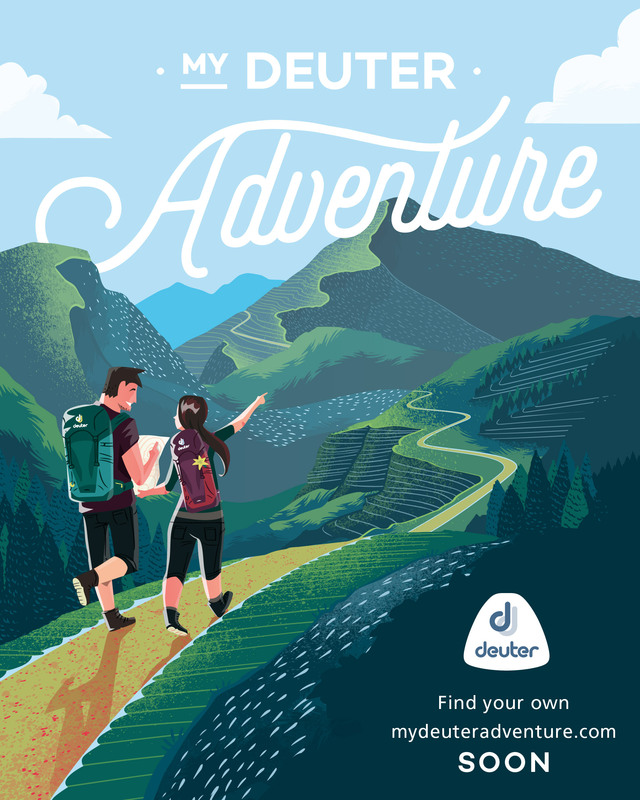 It has since evolved from a childhood fascination into a hiker’s high: Seeing the mountains from a distance makes me feel connected to them, and seeing some of them at once (an impossibility in the ground) is the same as seeing some of your good friends in one picture. My first reward in this endeavor was the sight of Pulag’s bald, golden peak on a flight to Batanes. 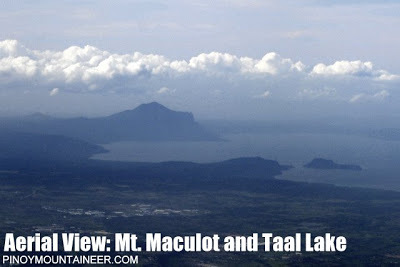 Next was the view of Bicol’s mountains in Hiking matters #184. The best time to do “aerial photography” is in the morning, when the clouds have not yet come to obscure the fantastic views. Even then, it is largely a hit-and-miss thing; you never know when you’re gonna get lucky, just be ready with your camera and get a good window seat! This time, I was lucky. Ten minutes into the flight, I saw Mt. 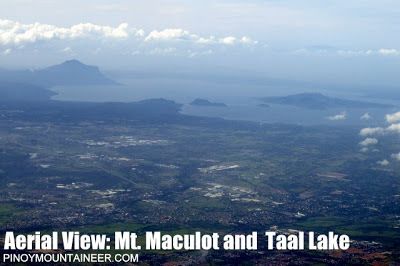 Maculot with its distinct shape, and Taal Lake beside it. 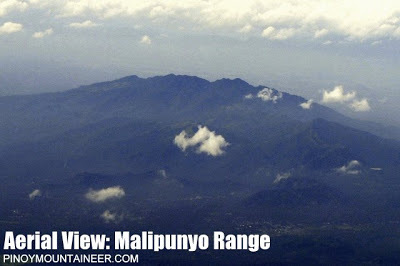 Soon, the Malipunyo Range also emerged. 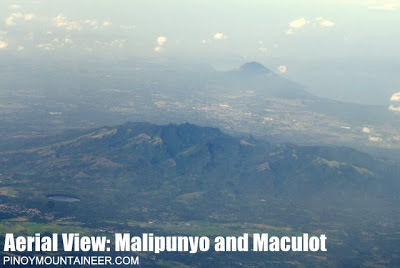 These are the most northeastern of the Batangas mountains and many flight paths actually provide an opportunity for the passengers to see them. 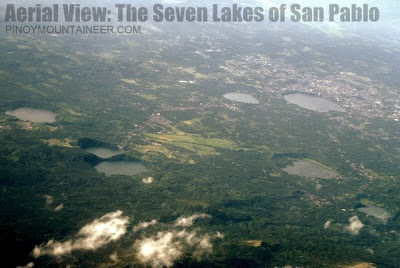 I was delighted when the next attraction came into view: none other the Seven Lakes of San Pablo! They were surrounded by mountains, most notably, to the northeast lay the two contiguous mountains, Mt. 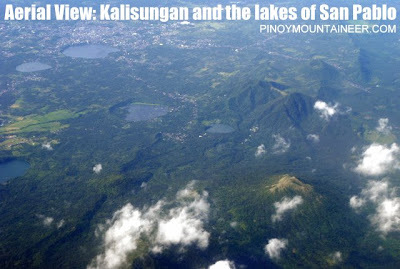 Kalisungan and Mt. Atimla! The grassland peak of Kalisungan was very visible, and beautifully contrasts with the blue-green background. Afterwards, we passed by Mt. 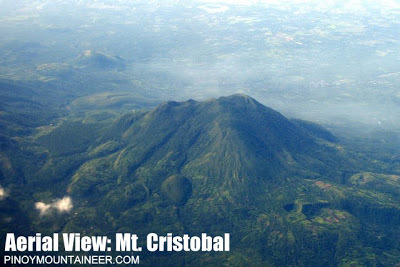 Cristobal and almost above Mt. 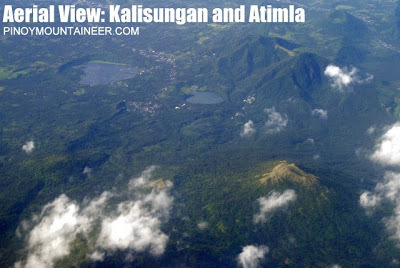 Banahaw, and whereas the latter was covered with clouds, Cristobal was perfectly clear and I took a lot of photos of it — what an amazing view to see from the air! Hopefully, I will be blessed with more of these splendid sights in future flights! 3 Comments on "Hiking matters #240: Aerial views of Southern Tagalog mountains and lakes"
hi sir.. bohol is also my province. aside from the beaches and im also curious of bohol's mountains that i wish i could climb one. Ive been to "krus daku", aside for its religous features, one can enjoy a panoramic view of neighboring towns, including that of Tagbilaran City. most of the flights i took are either the early or late ones. so i did not get to see these beautiful mountains. 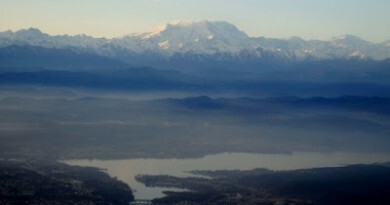 next time, will book the day flights to enjoy the mountain grandeur from up above. thanks for sharing those views. I've always enjoyed the window seat, especially during daytime. All these mountains seem so small from above!